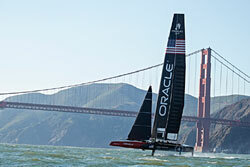 Senix: Oracle Team USA won the 2013 America’s Cup race with one of the most efficient sailing vessel ever built. Oracle Team USA’s AC72-class yacht, USA-17, was a 100’ long, 90’ wide and 223’ tall carbon fiber technological marvel capable of speeds in excess of 50 knots (57 mph). The yacht actually “flies” off the water on hydrofoils that lift the entire hull clear of the waves to reduce drag. Sailing this engineering masterpiece required more than 300 sensors and sophisticated computer control technology. More than 3,000 data variables per second are captured and displayed in a variety of formats on PDA’s strapped to sailor’s arms, on tablets mounted around the vessel, and on cockpit displays.